The history of solar power is a long one. The Sun was worshiped by many ancient civilizations. Native Americans worshiped the sun. So did the ancient Hindus, Greeks, Persians, Babylonians and Egyptians. Over the history of solar power, almost all early civilizations recognized the sun’s central importance in providing life giving energy. In ancient Greece the gods of the sun were Helios and Apollo, and many temples were devoted to them. Ancient Greek interest in the sun extended beyond religious beliefs though. They were the first to use passive solar design in their housing - as early as 400BC. Native Americans also used passive solar power. Houses were built into the side of cliffs or hills to benefit from the natural storage of heat during the day. This would then release warmth at night. The Romans were the first to use glass in windows to trap solar warmth in the home. They even had laws which made it an offence to obscure a neighbour’s access to sunlight. The Romans were also the first in the history of solar power to use glasshouses to create the right growing conditions for exotic plants and seeds they brought to Rome from the far reaches of their empire. In 1767 the world's first solar collector was built by Swiss scientist Horace de Saussare. He developed large cone shaped collectors that could boil ammonia to perform work like locomotion and refrigeration. Solar energy continued to intrigue and attract European scientists through out the 19th century. Edmond Becquerei, a physicist from France, observed the photoelectric effect in 1839. In 1861, Auguste Mouchout developed a steam engine powered entirely by the sun. Unfortunately, high costs resigned his invention to a footnote in the history of energy. During the 1880's, Visible light converting photovoltaic cells made of selenium were built and had 1- 2% efficiency. The first commercial solar water heater was patented in 1891 by American pioneer of solar energy - Clarence Kemp. 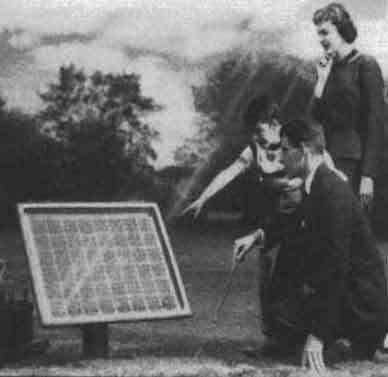 The history of solar power was fairly quiet for the first half of the 20th century, though interest in a solar power never completely disappeared. In fact, Albert Einstein was awarded the 1921 Nobel Prize in physics for his research on the photoelectric effect. By the early 1950's, a process for producing crystalline silicon of high purity was developed, called the Czochralski meter. This sped up the development of solar power. In 1954 Bell Telephone Laboratories released a 4% efficiency silicon photovoltaic cell, and later managed to achieve 11% efficiency. The first solar water heated office building was built by architect Frank Bridgers during the mid-1950's. In 1958, A small satellite of US Vanguard was powered by a less than one watt power solar cell. From the 1960's to the present day oil prices have played a big part in the economics of solar power. In the 1960's cheap imported oil was the main competitor to solar power and it restricted the solar technology market. 1973 to 1974 saw the oil embargo create opportunity for solar power to take off. The US Department of Energy funded the Federal Photovoltaic Utilization Program that began installation and testing of over 3,000 photovoltaic systems. The Gulf War of 1990 renewed interest in solar power as an alternative to oil and petroleum products. The mid 1990's had few incentives for solar electric homes or heating systems. Still, over 1 million US homes installed some form of solar power. Today, solar energy is used in two main forms for power. The first is thermal solar power where the sun is used to heat fluid, which drives turbines or other machinery. The second is photovoltaic conversion (solar panels) where electricity is produced directly from the sun. Every day the sun beams down upon Earth several thousand times as much energy as we use. Even the small amount that strikes our roof is many times as much as all the energy that comes in through electric wires. With the sun directly overhead, a single acre of land receives about four thousand horsepower at any given moment. That's about the equivalent of a large railroad train. From ancient homes built facing the warm winter sun, to modern advanced thin-film photovoltaics, humans have used the sun to meet their energy needs. This makes perfect sense - after all, the sun provides enough energy every hour to meet worlds demand for a year. For more information about the use of solar energy for heating, you can read about the nuts and bolts of home solar power at Alternative-Heating.com, a site that covers sustainable methods of heating such as solar home designs and highly efficient stoves. As you’ve read, technologies have changed and improved over the history of solar power. Still, the basics of solar thermal and photovoltaics have remained the same. Return from History Of Solar Power to Home Page.